With Thinglink, learning becomes interactive, exploratory, and engaging: teachers have an innovative way to present material, and students have a new way to demonstrate mastery of learning. Ever play a Blind Kahoot? Log on now to Kahoot.it! Level up to earn your learning badge! Read why images rather than bullet points are more useful in presenting new information. Create your teacher Thinglink account. Determine how students will access Thinglink: with their Google usernames & passwords? Or with teacher-created accounts? Learn how to fully integrate Google Drive & Thinglink. Transform the way learning material is presented and create your very own Thinglink. Either take something already in your wheelhouse and turn it into a Thinglink, or check out some of the brain-jumpstart ideas in the "lesson Ideas" section below. Assign a Thinglink project in Google Classroom and have students submit it. Watch this video to learn how. Copy and paste your Thinglink creation into this GoogleDoc so we can see your awesomeness! 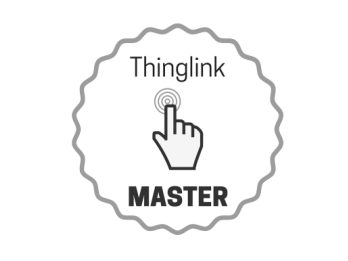 Complete this Thinglink Master Badge Request Form to celebrate your achievement. What are some ways you and your colleagues could start using Thinglink in the classroom? Share your brainstorms here.